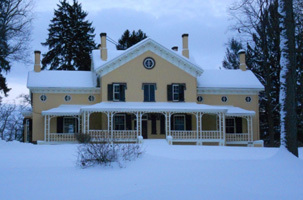 After visiting Maple Grove; an historic 19th-century home on the South Side of Poughkeepsie; Linda Roper was impressed by the ambience of the old house, so she decided to take an active role in it's restoration. Originally a native of England, and an actress who attended the Royal Scottish Academy of Music and Drama, Roper coordinated a group of local actors and actresses, and founded the OVER THE POND TO POUGHKEEPSIE ENSEMBLE. Since its formation in 2009, OVER THE POND TO POUGHKEEPSIE has performed numerous play readings and other theatrical events. All donations collected at these events are used to help renovate Maple Grove. The exterior is coming along nicely, but it is now time to start working on the interior. Call 845-471-3248 for info and tickets. At each performance, donations to help restore the site are encouraged. 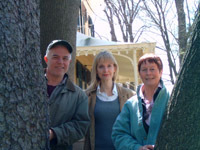 Over the Pond to Poughkeepsie members Chuck Muckle, Nancy Auffarth and and Linda Roper (pictured L-R below) will be fund raising for Maple Grove by reading Lettice and Lovage..
“Enlarge! Enliven! Enlighten!” is the battle cry of Miss Lettice Douffet, indefatigable enthusiast of History and The Theatre, imaginative and implacable enemy of the “Mere”. 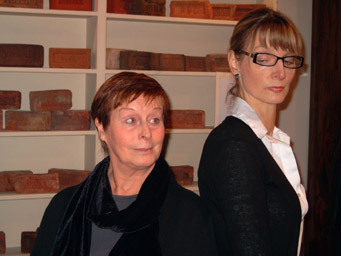 Her encounter with Miss Lotte Schoen, formidable devotee of unvarnished Fact, could hardly be expected to be fruitful, yet a deeply productive friendship develops between the two when they discover they share a mutual enthusiasm for the grandeur of non-Mere days gone by, and an equally passionate loathing for the vileness of modern British architecture - with which they decide to deal. 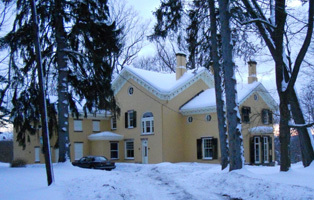 Maple Grove is on the National Register of Historic Places and is located at 24 Beechwood Avenue in Poughkeepsie. The mansion was built in 1859, and reconstruction and renovation efforts are under way. For directions or more information about Maple Grove, call (845) 471-9651, or visit www.maplegroveny.org.